This is the plan that most people think of when they want to avoid the cost and delay of probate. In Southern Utah where I live, it is not uncommon for the value of the most basic estate to exceed $250,000. That is because even though real estate values have dropped, their value is still high. In California, a $500,000 probate might cost over $26,000 in executor, attorney’s fees and court costs. Avoiding probate using the revocable trust will save a substantial amount of that expense. Most importantly because those fees are based on the gross value of the estate, the net distribution to the family is significantly reduced because of those fees. Remember, the distribution to the family or the total value of the estate that will be distributed is after payment of taxes and debts, including any debt on the family residence. 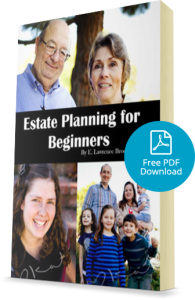 During this economic downturn, many children have received very little after the parents passing because the major asset was real estate and the probate fees consumed what little amount was left. This situation could have been avoided if they had done a Revocable Living Trust. 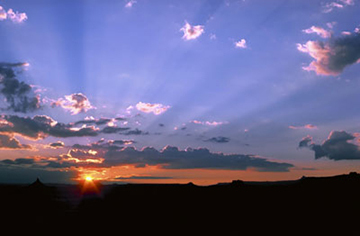 The Probate Avoidance Plan uses a revocable living trust that you create. A trust can be described as a bucket that you create and place all of your assets into. Your assets are then removed by the trustee, you, while you’re alive, for the benefit of whomever you decide. If you become incapacitated or disabled, or upon your passing a new trustee takes your place. That trustee is selected by you at the time the plan is created. 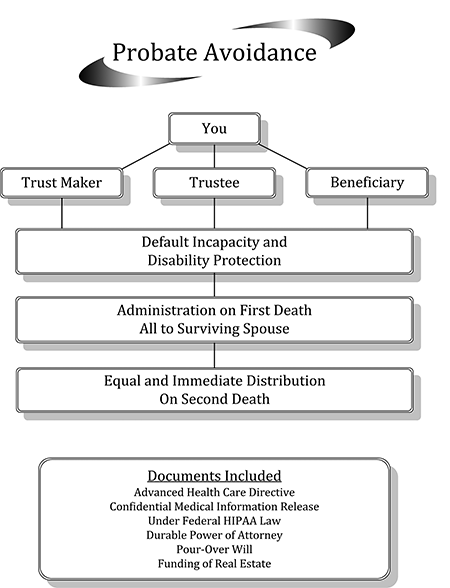 At a time of incapacity or disability, the new trustee takes care of you and your loved ones and thereby avoids the expensive court conservatorship and guardianship proceedings. Not only is this proceeding expensive, but there’s nothing more emotionally traumatizing and humiliating than standing up in court and asking the judge to give you authority to take care of your parents who can no longer take care of themselves, while one of your siblings is objecting to your request. On your passing, the successor trustee administers your estate. There will be an estate administration for every individual on their death no matter how large or how small their estate. In its simplest form, the administration consists of gathering all the assets, value the assets, make sure that the creditors are paid and then distribute the assets to the individuals you designate, generally your children and loved ones. All the benefits of the Will Plan and all the ancillary supporting documents of the Will Plan are part of this plan as well. Plus a Pour-Over Will, which directs that all property not owned by the Trustee go into the Trust and be distributed according to the terms of the Trust.